In a bid to curb the circulation of fake news, YouTube is adding new "information panels" that will surface fact checks to help users determine whether claims related to their search are true, false, or partly true. 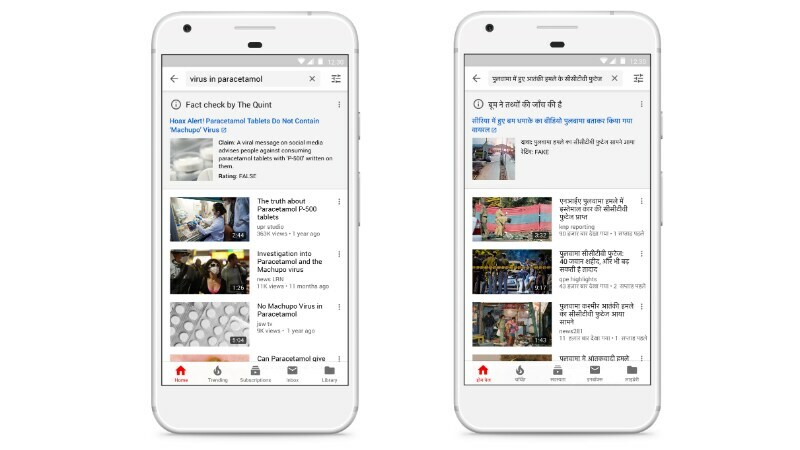 The video streaming is rolling out the new feature to a limited number of users in India at the initial stage -- for search queries in both English and Hindi. However, YouTube has plans to expand the presence of the information panels to other markets throughout 2019. The new move notably comes just weeks after YouTube announced that it is tweaking its recommendation algorithm to prevent promoting conspiracies and false information. YouTube has revealed through a support page that it has started providing relevant fact checks from "approved" publisher partners. These fact checks will be available in the form of information panels -- just on the top of the search queries. "When you search for something on YouTube, you'll sometimes see an information panel that includes fact checks," the company wrote on the support page. The aim of the new development appears to provide appropriate fact checks for the videos that could contribute to the circulation of fake news and misinformation. The information panels will highlight the fact checks of the searched videos through verified partners. They will include the claim being fact-checked, the name of the publisher doing the fact check, a summary of the publisher's fact check finding, and a link to the publisher's article. All this will help users read appropriate information about their search queries before started watching the searched videos. Notably, the presence of the information panels isn't likely to impact the search indexing process of YouTube. This means the users would still continue to see videos having the tendency to spread false information. But nonetheless, the information panels should help YouTube warn users about fake news and misinformation being circulated around a particular topic. The intention seems to essentially provide context to users for what they're searching but at the same time giving them the freedom to watch any of the listed content. It is important to mention that the support page explicitly says YouTube doesn't endorse or create any of these fact checks, and users need to report the website owner that published it for any conflicts. "As part of our ongoing efforts to build a better news experience on YouTube, we are expanding our information panels to bring fact checks from eligible publishers to YouTube," the YouTube spokesperson said in an email to Gadgets 360. "We are launching this feature in India and plan to roll this out in more countries as time goes on." BuzzFeed News first reported the arrival of the information panels on YouTube. It was also said that the panels would appear when users search for controversial or sensitive topics. The fact-checking partners need to follow the schema.org ClaimReview markup process to enable their content for the information panels. The partners also need to follow the eligibility requirements to contribute their fact check articles that could appear in search results on YouTube. Back in January, YouTube had announced that it is tweaking its recommendation algorithm to prevent the spread of conspiratorial content. The Google-owned company also recently updated its community guidelines to reduce the count of objectionable content.